Jesus told stories. In fact, He told a lot of them. Why? Because stories helped Him connect life-changing spiritual principles to situations and circumstances people in the audience were familiar with. 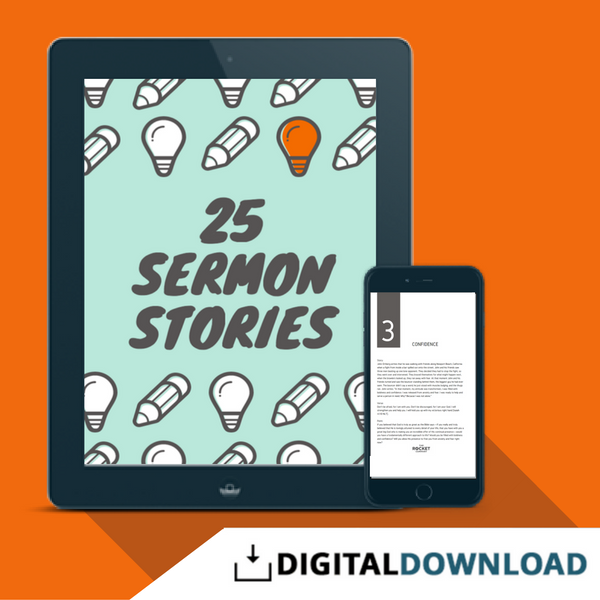 Use these 25 Sermon Stories from The Rocket Company to build your next sermon, generate sermon ideas, or simply as a tool to connect with your congregation. Jesus told stories. In fact, He told a lot of them. Why? Because stories helped Him connect life-changing spiritual principles to situations and circumstances people in the audience were familiar with. He used them to create a bridge between people’s hearts and the message He wanted his followers to understand. Stories are no less powerful today. These 25 Sermon Stories from The Rocket Company aren’t some hokey, made up “preacher stories” we’re all familiar with. They are real stories that feature an illustration, a scripture reference related to the story, and a key point of application. You can use them to build your next sermon, generate sermon ideas, or simply as a tool to connect with your congregation.